First political consideration regarding renewable energies were made in 2006 when the Government adopted a law which sets out licensing procedures for independent power producers and auto-producers. 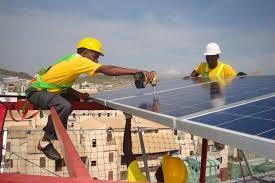 In 2011, Cape Verde determined its renewable energy policy framework in greater detail including a roadmap how to reach 100% renewable energy by 2020. A scientific based discussion on the benefits had preceded this political decision. As Cape Verde by today is dependent on the import of fossil fuels to meet its energy demand high economic benefits derive from a shift to 100% renewable energy – especially as energy demand is predicted to rise in the next years. Besides the huge cost savings, Cape Verde shall be converted in a model for zero emissions on a global scale and a knowledge hub for several sub-regions. The economic difference is supposed to be invested in further renewable energy generation in order to produce desalinated water, creating new industrial symbioses cycles with dispatchable consumers and an extension of the energy transmition grid as well as energy storage options. Hence, the renewable energy investments are investments in new business sectors and positive future developments. An important aspect during the political process adopting the target of 100% RE was to get the public support for this major shift regarding the energy supply of the islands. Therefore, public consultations were held in each of the four islands where wind projects were built and comprehensive Environmental and Social Impact Assessments were conducted. In particular local landowners were engaged in the siting of the projects and a consideration about securing grazing rights underneath the wind turbines was included in the course of the involvement of traditional livestock herders. By this means Cape Verde’s renewable energy strategy is not only leading in terms of its target to reach 100% RE within the next years but also in the details of its Approach considering its environmental stewardship and social responsibility for the people.